NBC4 meteorologists Doug Kammerer and Sheena Parveen. Get your baseball caps ready — NBC4 is partnering with the Washington Nationals for Weather Day at Nationals Park on Thursday. Storm Team4 Chief Meteorologist Doug Kammerer hosted a weather presentation at the park Thursday morning in advance of the Nats' game against the Pittsburgh Pirates. 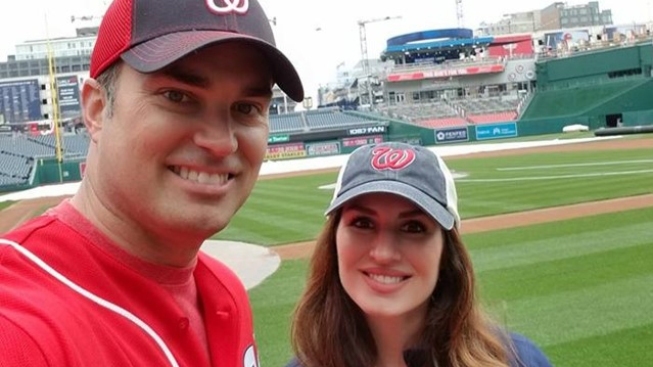 He will also throw out the first pitch before game time at 1:05 p.m.
NBC4 had live coverage from Nationals Park on News4 Today starting at 4 a.m., and the weather presentation followed later in the morning. NBC4 also has a booth at the park. You might even see the NBC4 Peacock during the Presidents' Race. Tickets for schools, teachers and other educational groups start at $16 and can only be purchased online by contacting Jessica Kaufman at Jessica.Kaufman@nationals.com. Those fans will receive a free meal — hot dog, chips and a drink — and were invited to participate in the weather presentation. Tickets for the general public are available here. Don't forget to use the hashtag #WeatherDay to share your photos with us!